Why should you join the Chamber? What's in it for you? Newsletters, weekly media reports in the newspaper, local newspaper features, local cable channel reports and business correspondence. Assistance with member expansion or relocation projects. Tourism promotion. Community quality of life projects and beautification. Free one on one small business counseling provided by the Small Business Development Center – UWO plus affordable educational workshops and programs. Free promotional features in the Chamber newsletter, local newspaper and Chamber and community events. Joint advertising programs in the newspapers, on the radio and using direct mail. Member’s name, address, phone, and contact name listed alphabetically and by the service they provide on the Chamber website: www.newlondonchamber.com. Advertising discounts, Visitors Guide, event participation and educational workshops. Members are encouraged to offer member-to-member discounts that will be promoted in the newsletter and on the website. Meet Your Business Neighbor (MYBN) events to showcase you and your business to other New London businesses. The entire membership and guests are welcome! The Chamber answers thousands of calls per year and always refers Chamber members first! Notify the Chamber when you offer new products and services. If we don’t have the answer, we’ll find it! Visitor info, relocation packets, business information, up-to-date fishing conditions, local up-coming events, phone numbers for other Chambers and tourist centers plus Chamber member business mailing labels. Your Chamber is a voice at local City staff and Council meetings, involved in community events and active in business development issues. Opportunities vary so that they can fit your needs and budget. These are great ways to get your name, business or organization out in front of the community. The Chamber office serves as New London’s Visitor Welcome Center and contact for New London Tourism Commission providing New London brochures, advertising and other promotional materials. In addition, New London information packets are mailed to prospective visitors and potential residents moving to our area. See www.newlondontourism.com for information. The New London Area Chamber of Commerce is a member of the Waupaca County Visitor and Promotional Council and works to distribute 60,000 Waupaca County Visitors Guides each year. New London is represented at multiple sport shows in Milwaukee and Illinois promoting the New London area and all that it has to offer visitors and sportsmen. Meet on a monthly or as needed basis. Purpose: To give overall direction to the activities of the organization and set the policies. The Board consists of not less than 12 and not more than 15 members and includes the following elected officers; President, President-Elect, Vice-President, and Treasurer. What is a Chamber Buck? – It is a certificate / check that is redeemed at a Chamber members’ business for service and / or merchandise. Where can they be purchased? – Call or stop at the Chamber office. Can be made for any dollar amount. How do I know where to redeem them? – Click here to see the list of Chamber members that accept Chamber Bucks for services and / or merchandise. As a redeeming Chamber member, simply deposit the Chamber Buck like a check. They are bar coded and will be reimbursed by our Chamber Buck account. Businesses, clubs, organizations and individuals are using Chamber Bucks. Give them as an incentive program award, for birthdays, anniversaries, Christmas gifts, or just because. Call us and we will have them ready for your pickup. The Chamber works with the School District of New London and the Waupaca County Economic Development Corporation to create lines of communication between the schools and local businesses. Our goal is to form relationships and educate students, staff and parents about the vast amount of opportunity the New London workforce has to offer. Not only do we partner with the School District for an annual career fair, but the Chamber provides a variety of resources and tools for both businesses and students allowing them to connect and learn from each other. All Committees meet on a monthly or as needed basis. Purpose: To uphold the continued responsibility of welcoming new businesses to our community and to the Chamber. Coordinate Chamber networking events. Lead ongoing membership recruitment and retention. This committee is the eyes and ears of the Chamber, promoting the benefits of membership and evaluating member satisfaction. Objective: To learn about what’s happening with the Chamber and each other. Each attendee is given the opportunity to introduce themselves and their business and share something about their business that they want others to know. 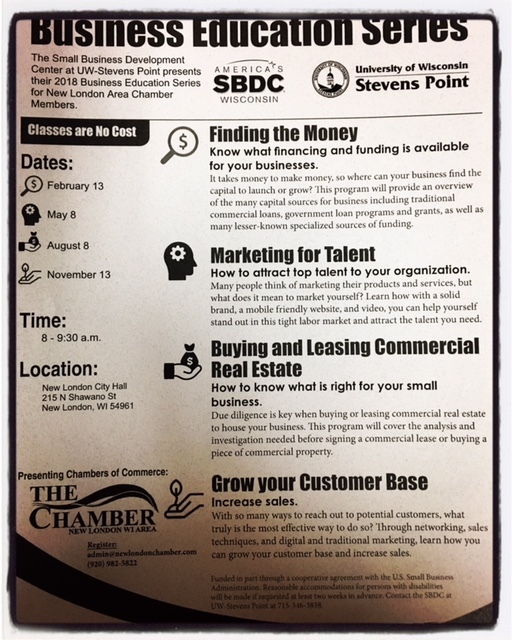 Use this opportunity to promote yourself and educate yourself with the offerings of other Chamber members. All Chamber members are invited AND encouraged to attend! Role: To coordinate Chamber hosted community events such as Women’s Wellness Day, Chamber Beer Tasting, Chamber Golf Outing, Fall Family Fest and Holiday of Wonder. to our Chamber Members only. A great way to reach your target market! What is the Loyalty Program? – It is a member-to-member discount program in which our members in good standing offer special discounts to other Chamber members and their employees. What are the discounts? – Participating members design their own discount. Discounts are on going and the members have the option to continue, revise or remove their discount from the program. How do I receive the discounts? Visit the Loyalty Program on our website for discounts! How do I participate? Complete a Loyalty Program Agreement Form and return it to the Chamber office. Businesses, clubs, organizations and individuals are taking advantage of the Loyalty program. Call us and we will assist you in designing a discount. Chamber Bucks Program – Over $70,000 sold annually! We are a member of Wisconsin Chamber of Commerce Association (WCCE), the Waupaca County Visitor & Promotional Council, and the New London Tourism Commission.